Historian Joan Scott famously wrote that "experience is not a word we can do without although it is tempting given its usage to essentialize identity and reify the subject, to abandon it altogether." "Experience" as a framework enables us to understand the role intimacy, emotion, and desire play in food history. Today's guest post by Jennifer Jordan highlights the relationship between food, personal history, regional history, and mourning. I meant to write on another topic--apples, perhaps, one of my favorite things—but life, or rather death, intervened. So instead I want to write about food and mourning. If your heart is aching from the loss of someone close, you might want to read this another time. If you want to have a good reason to feed someone who is grieving, read on. All my life, until this past August, I had only once thought to bring food to a grieving family. I had heard about links between food and grieving, of course, including the “funeral potatoes” described by a caller on a radio show I did a few years back (see here, around minute 40). In the context of a broader discussion about edible memory and foods that evoke emotions and recollections, the caller described attending a funeral where multiple guests brought exactly the same dish, known as funeral potatoes—some combination of frozen hash browns, cheese, and possibly potato chips. I had even witnessed the food of mourning myself while living in Austria years ago. 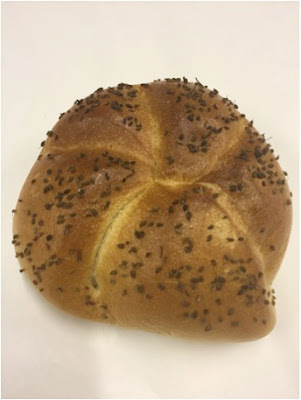 Specifically, I ate a “Konduktsemmel,” or funeral roll, a giant, fluffy white roll studded with anise and caraway. I felt like I hadn’t earned it, because the baker in the tiny Austrian village where I was staying had made it for the funeral of a villager I didn’t know. If I recall correctly, his coffin was carried slowly up the hill from the church in the center of town to the little cemetery above the 400 year old house where I was staying. We heard the funeral procession pass, a mournful brass band accompanying the deceased on his final journey. In the village I knew best, Beuschel was a Leichenschmaus favorite, though I never had it served to me. A stew made mostly of lung, added to beef soup, it was perfect for using the Konduktsemmel to sop up the broth. I heard stories of past generations of women of the house where I was staying cooking enormous vats of Beuschel for funerals on a vast, home-made woodstove. Years later, in Wisconsin, I witnessed the outpouring of baked goods that accompanies the church supper after a Catholic funeral, in this case for my now-husband’s sister-in-law. 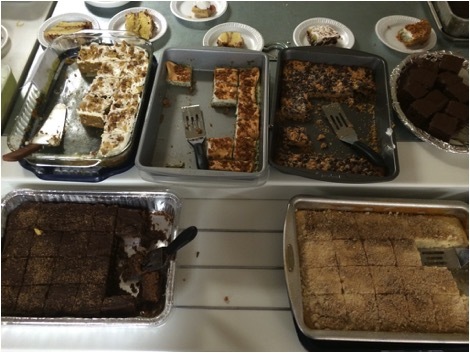 In addition to a cooler full of beer, and aluminum pans of turkey and pulled pork, the countertop between the kitchen and the dining room of the church basement groaned with desserts baked by the women of the church. A trio of older women supervised the cutting and distribution of the bars and cakes and pies. The food, and the quiet shuffling from the long service upstairs to the brightly lit basement underneath the pews, were integral parts of a mourning process. The first time I thought to bring food to mourners was just over a year ago. I was among the grieving, but removed enough to feel responsible for a bit of nourishment. Six months before our wedding, my then-fiancé’s father passed away. The burial in a windswept cemetery was accompanied by a military honor guard, and the out-of-town guests each wore an ill-fitting jacket belonging to the deceased, since they came from warm places where no jackets were required. After the burial in the cold hard earth of a Wisconsin December, we joined the whole family back at my would-be father-in-law’s now empty house. On the way, I made my future husband stop at his childhood bakery, to get coffee for me and a kringle for the family. If you haven’t been to funerals, faculty meetings, or holiday parties in Wisconsin, you may not have had a kringle, but they’re a staple around here. If you’re ever on I-43 between Chicago and Milwaukee, there is a truck stop in Racine that supposedly sells the best kringles money can buy. This was the first time I had ever brought food to mourning people, and it felt somehow forced. I wondered, as I set the great ring of pastry down on the old formica kitchen table where my husband and his brothers and sisters had eaten countless meals together, if it was superfluous, an unnecessary gesture by an outsider like me (a Californian!) trying to blend in. Within an hour every crumb of kringle had been devoured. I kept seeing siblings emerge from the kitchen with a hunk of kringle in their hands, fueling up for a bittersweet day of remembering and planning. There was plenty of savory food leftover from the church basement supper the night before, but that bit of sweetness struck a chord. Still, despite some familiarity with loss, and with the symbolic and caloric importance of food for the grieving, I was unprepared for its value. Two and a half months after my wedding, my own father had a stroke, at my childhood home in California. My husband and I were on our honeymoon on the other side of the country, but I had the great fortune to make it back to California in time for what turned out to be my father’s last night. Early in the evening, soon after I arrived, the doorbell rang. I opened it to find our new nextdoor neighbors and their nearly grown son, holding a quiche wrapped in foil. This homemade gift sustained us that night and in the days after my father passed. Later the neighbors told us it had been their sweet son’s idea to bring us a quiche—since his dad was making one anyway, why not make two, and give one to the Jordans? In the following days many friends and neighbors fed us—turkey chili, curried lentils in homemade stock, corn chowder, eggs from the backyard chickens we could hear quietly clucking in the morning. Often someone would just leave something on the front porch, not wanting to bother us. Other times the food would come with a tearful hug, a card, a little bouquet of flowers. And now, I will always bring food to the grieving. Maybe you have been doing this as long as you can remember, but even if you never have, even if you are not that person, even if you are not raising chickens or making homemade stock, please consider nourishing the bereft. Even if it is someone you don’t know that well, even if you don’t have time to cook yourself. A bowl of pears, a store-bought pie. Even when grief robs us of our appetite, what a gift to discover half a dozen fresh eggs on the front porch, or to open the fridge in a brief flicker of hunger and realize that you are not alone. Jennifer A. Jordan is Professor of Sociology and Urban Studies at the University of Wisconsin-Milwaukee. She is the author of Structures of Memory: Understanding Urban Change in Berlin and Beyond (Stanford, 2006), Edible Memory: The Lure of Heirloom Tomatoes and Other Forgotten Foods (Chicago, 2015), and the in-progress Before Craft Beer: Lost Landscapes of Forgotten Hops (Chicago).